Finally managed to go out before it's too dark to take photographs. Just checked out some shops on High Str Kensington and grabbed a dinner with the boyf afterwards. I couldn't be bothered to put any thought into today's outfit, so perhaps it's a bit matchy matchy? or not. Anyways, above you can see a pic of the boots I ordered for him on Solestruck.com together with my Clinics. Tan suede, military green panels and high top.. aren't they simply gorgeous? The best part is that they match my closet :-) Now I just have to push him into buying slim cut jeans, which's gonna be a tough one. once again flawless! n i love the pic with topshop in the background one of my fav stores! WOW! You blog is amazing. Love your style and you are a total beauty! I am following! Mmh Actually I always think that using male's vestiary paradoxically can be the better way to sublimate the Femininity of the One who knows how to play with, AND this exquisite pastel tones ideally tend to confirm that . . .
ps: AAaaw you Truly are "Vavavoooooooom-iciously" Breathtaking on your "snap snap" post Dear !!! Love your blog! I have jeffrey campbell clogs too!You have a new follower! 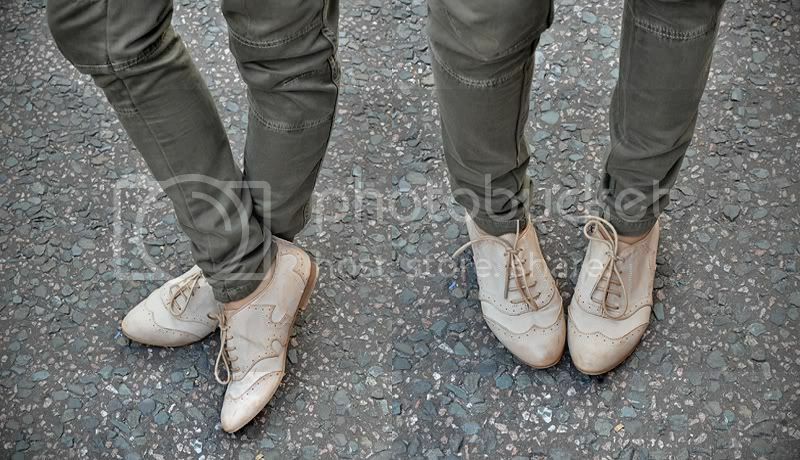 I love your blog, especially your shoes!! You really look gorgeous. I particularly love your brogues. wow you are so beautiful!!! yeah i was born in the ukraine, but we moved to germany when i was 3 years old. wooow you're beautiful,i love your style and your blog. wauw lovely outfit & you are beautiful! wow, your outfit is amazing and you are beautiful girl! Wooow! Your blog looks awesome! I like your shoes, they seem so comfy and they are cute!! I'm new at blogging and i would be very pleased if you could tell me some tricks to personalize my blog (changing the html). Your blog is great - really inspirational. Have just added you to my 'visit these sites' section! I give birth to infer from a only one of the articles on your website now, and I extremely like your fashionableness of blogging. I added it to my favorites web age muster and will be checking stand behind soon. Divert check out of order my position as approvingly and vindicate me conscious what you think. Thanks.